So that Techno Son-in-Law could run the school PTA Social Event and AGM while Cheshire Mum was returning from a London conference the Cleddau crew were needed in Macclesfield: just deliver and collect the Cheshire One from school, provide Part 1 Tea, take to weekly swimming lesson, return home for part 2 Tea, do bath and hair wash, read stories and put to bed… The AGM and Social Event were duly conducted – and, Check, our mission successfully completed. Mid-morning on Saturday anglers and the occupants of a boat moored alongside the towpath opposite the moorings watched as Cleddau was eased away from the pontoon. There was gentle fending off from the neighbouring boat, some very careful reversing out and then Cleddau was swung north bound, just for a few hundred yards, before another precise manoeuvre was required to wind the boat to head south. 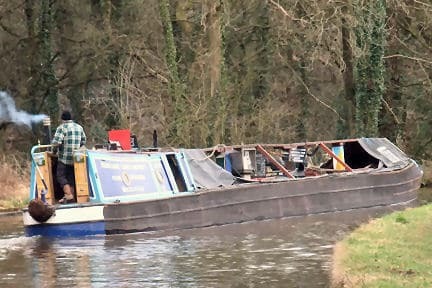 Off we set, past The Trading Post, (new name: Bailey’s Trading Post) open for hot drinks, diesel, pump outs and marine maps, off past the wider water which runs alongside Poynton’s recreation ground, heading south towards Bollington. The steep slopes of Lyme Park were to our left while on the right was the towpath, in some places a quagmire, in others a dry and easy walking surface. There was a chill in the wind but winter’s end was being heralded. Birds sang overhead and clumps of snowdrops provided splashes of white amid the dull and bare hedgerows. As the boat approached Lyme View we came upon our first Canada Geese flock. It was mid-morning break: a small group of about three or four geese were on the field, feeding; a larger group was perched on the bank, gossiping, while a third group was doing swimming practice close by. Further on, at Hurdsfield, another tribe was gathered on a meadow, all geese facing the same way, just two separated individuals calling harshly for companionship from the bank’s edge a hundred yards further on. Late afternoon we chanced upon a third flock, these swooping in V formation, squawking and calling, coming in to land on their roosting field. On the cruise went, through Bollington, Kerridge and Macclesfield, for just about nine and a half miles. Where were we to turn round? Check the Captain’s map (Nicholson): beyond the Oak Grove swing bridge. Check Boatwif’s favourite map (Geo Projects): a winding hole at Lyme Green is marked. So, cold to the core, the Cleddau crew turned the boat at Lyme Green, and cruised a half mile back to the Gurnett Aqueduct. Seagulls wheeled over head while the sound of cheers, roars and drums floated across a couple of fields from the Macclesfield Town football ground. 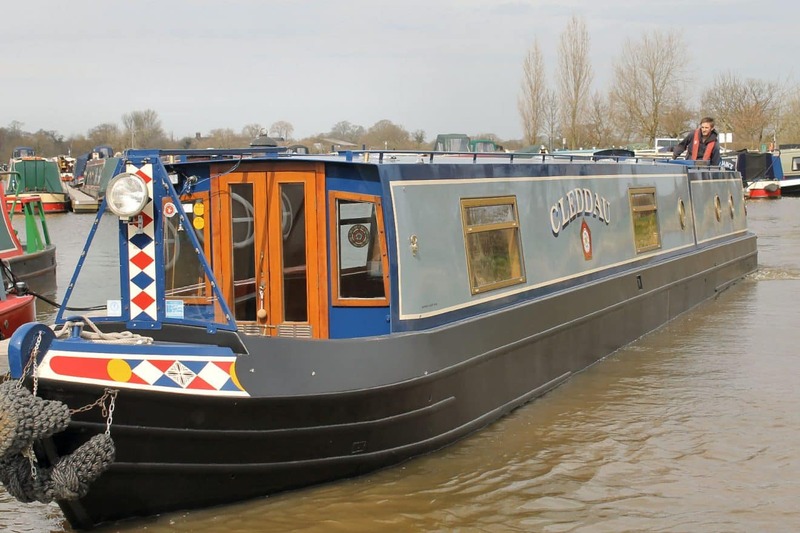 A good mooring: boat hatches were closed, the cratch dropped, the fire opened up. We thawed – and an owl hooted from the hedge. After a quiet night (bar the coughing) a dry day dawned. Two moorhens lurked optimistically by the side hatch. Boatwif weakened, sprinkling a few crumbs of bread. A swift response arrival brought another two dozen moorhens, shoving and pushing one another out of the way, throwing water splashes right up to the hatch opening. We cast off, a lone church bell tolling. Back through Macclesfield, noting changes here and there: the goats near the canal apparently gone, various solar panel arrays, a huge transport depot being dismantled, foundations being laid on a site right next to Swettenham Wharf. It was mid-morning and still. Now a peal of bells rang out from one of the larger town churches. On we cruised, past the lengthy site of Astra Zeneca (pharmaceutical manufacturers), a new mooring being created at Kerridge, an alligator guard outside a mill cottage, the sad looking gorilla at Bollington Aqueduct, window cleaners high up in a cherry picker at Clarence Mill. We pulled in for an overnight mooring opposite Lyme View Marina. Here was time for a Middlewood Way stroll, and a towpath wander past the frowning anglers, participants in a fishing match. On Monday morning it was but a half hour cruise back to Cleddau‘s home moorings. No sign now of anglers, joggers and dog walkers, just nb Alton, the coal and diesel carriers, wending its way around the Cheshire Ring.